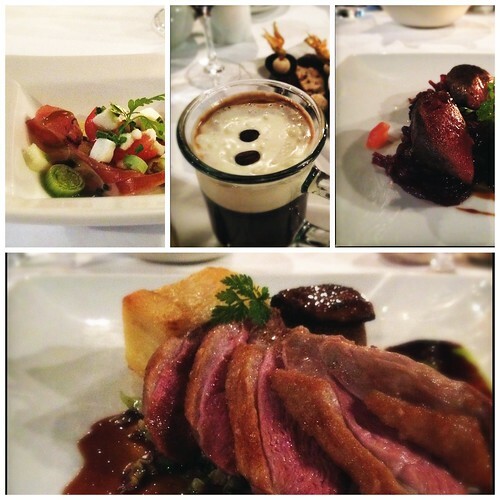 Pictured, clockwise from top left: amuse-bouche of parma ham and spring onions; amaretto coffee with petit fours; pigeon with red onion compote and black pudding; duck breast with foie gras and dauphinoise potato. The photos could have been better, but I was busy savouring the food, wine, and conversation. I was also pleased to note the presence of a print of F.C.B. Cadell’s “The Blue Fan” over FunkyPlaid’s right shoulder; I saw the original in the Dean just a few days earlier.